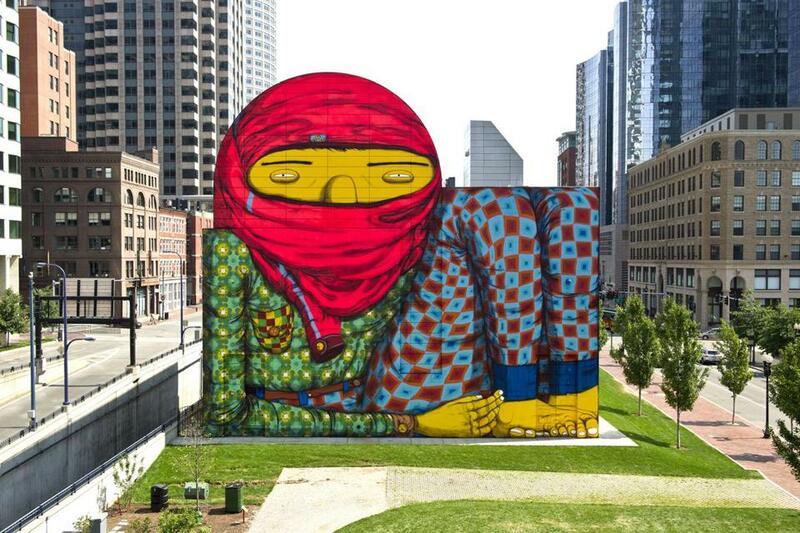 The Os Gemeos mural at Dewey Square. Boston, say goodbye to the giant boy in mismatched pajamas who has inspired praise and controversy as he hovers over Dewey Square. His time is up. After deeming the brightly colored mural facing South Station a success because of the amount of talk it generated, the Institute of Contemporary Art has commissioned British-born Matthew Ritchie, known for using scientific principles to inspire his work, to take over the enormous outdoor canvas. Ritchie’s 5,000-square-foot seascape will be installed the week of Sept. 16 and remain up for as long as 18 months. The collaboration, to be announced Monday at a Boston Arts Commission meeting, is part of a residency for Ritchie that will include a multimedia performance with members of the rock bands The Breeders and The National, concerts at the museum and elsewhere, and a video project to be produced with the ICA’s teen program. But the biggest splash for the public will come on the exterior of the Big Dig ventilation building in Dewey Square. 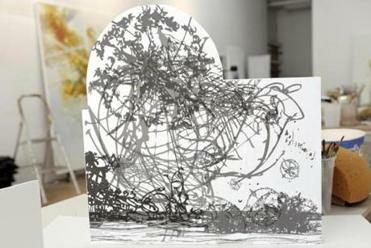 The model for Matthew Ritchie’s mural. The current installation by the Brazilian twins Otavio and Gustavo Pandolfo, known as Os Gemeos, was the first to feature art on the wall. The experience was worth repeating, according to officials from the Rose Fitzgerald Kennedy Greenway, the ICA, and the city. They say it created buzz throughout Boston and brought art to the public without requiring people to pay admission fees or even visit a museum. It also beautified a public space along Atlantic Avenue that thousands of people pass through during the day. “Public spaces like that cry out for artistic intervention,” said ICA director Jill Medvedow. The Rose Fitzgerald Kennedy Greenway Conservancy agrees and will fund the $17,000 production costs of the new installation. More than two dozen people wrote or called the Boston Arts Commission to raise concerns, far more than they normally hear from the public over a major exhibit. Ritchie’s project is unlikely to inspire a similar battle. But Karin Goodfellow, director of the Arts Commission, said she expects the work’s more abstract nature will get people talking. Ritchie’s proposed mural, with a working title of “Remanence: Salt and Light,” shows what appears to be a beach, with the area above occupied by a host of floating designs. There is no color, only different shades of black and gray. Some of the objects look like planets, others like mathematical equations. “It’s a kind of art not a lot of people are familiar with,” she said. What’s more, Goodfellow says, the very idea of regularly doing such high-profile art projects is meant to change the perception of Boston as a place not known for putting innovative works on display in public spaces. Pieces listed in the city’s public art database include mostly century-old bronze statues and the Bunker Hill Monument. 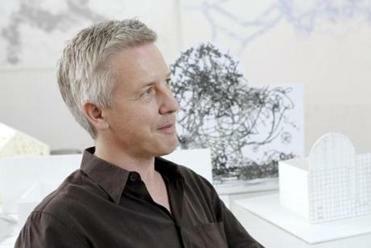 Artist Matthew Ritchie is known for taking inspiration from scientific principles. Jenelle Porter, the ICA curator who is overseeing the Ritchie project, said she’s excited to have a piece so different from the Os Gemeos work. As part of the residency, Ritchie will adapt a performance piece for Boston called “The Long Count.” The piece will feature music, projections, and Kim and Kelley Deal of The Breeders and Bryce and Aaron Dessner of The National. For Ritchie, who lives in New York but attended Boston University one summer in the early 1980s, the idea of doing a work on the Greenway is exciting. He remembers what he calls the “Green Giant,” the rusty steel of the Central Artery that used to occupy the space, and the once-desolate Fan Pier. The Greenway changes take the city back to a time when Boston had the feel of a place related to the ocean, he said. Ritchie’s residency will also include a performance in the ICA lobby by Bryce Dessner and composer Evan Ziporyn , as well as a concert in the nearby Chapel of Our Lady of Good Voyage with a children’s choir and Shara Worden, the singer and leader of indie folk group My Brightest Diamond. Geoff Edgers can be reached at gedgers@globe.com.